Round cricket-themed cake, comprising golden sponge, vanilla buttercream, raspberry jam filling, covered in a white sugar paste. 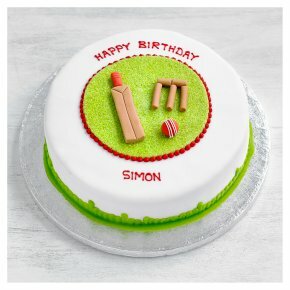 Cake is decorated with sugar paste wickets, stumps & ball, together with a personalised message in royal icing. Contains Egg, milk, and wheat.